Following on from that devastating climax to Avengers: Infinity War, many of us are on the edge of our seats with anticipation about how – or even if – things can be put right after Thanos’ triumph. But one very important question remains: where, in the middle of all this, with the universe set to literally divide by two, was a certain Avenger this whole time? Why didn’t they join the fight against that hulking (no pun intended) purple monster with the golden glove? What other business did they have to attend to instead? Where, oh where… was Hawkeye? No idea, but Ant-Man’s been up to a fair bit in that time too, as seen in his newest starring vehicle Ant-Man and the Wasp, which doubles down on the fun and entertaining action that made the first film an enjoyably light-hearted romp, not to mention its heavy sense of humour and general likeability, all of which makes for a pretty charming and delightful pallet-cleanser that’s sorely needed after the bleakness of Infinity War. Taking place a couple of years after the events of Captain America: Civil War, in which Scott Lang (Paul Rudd) assisted Captain America and his allies by memorably growing to giant size, only to be caught and placed under house arrest in the aftermath. We pick up on him a few days before his sentence is up, when he is suddenly thrusted into helping his former mentor Dr. Hank Pym (Michael Douglas) and his daughter Hope (Evangeline Lilly) by locating Pym’s wife Janet (Michelle Pfeiffer) somewhere in the miniscule Quantum Realm, where she has been trapped for years. 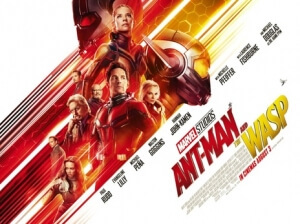 Their efforts are made a little more complicated by the unwanted attention of sleazy black market dealer Sonny Burch (Walton Goggins), and a mysterious figure known as the Ghost (Hannah John-Kamen) who has the ability to phase through walls and solid objects – so it is down to Lang, donning the shrinking and growing guise of Ant-Man once more, and Hope, who now has a shrinking suit of her own as the Wasp, to stop these outside forces from interrupting their mission. Ant-Man and his size-altering powers have always been regarded as one of the more ridiculous heroes in the Marvel comics history (at least, to those unfamiliar with the superhero), so it only makes sense that any feature based on such a character would be something of an all-out comedy, and both the first and second film have set a tone for themselves that really embraces how silly the overall idea is, and never takes it too seriously. Director Peyton Reed – who as we all know took over from original director Edgar Wright on the first film, and here feels much more confident in his approach rather than working off of someone else’s vision – manages to get some strong laughs out of some of the things that come from this idea, whether it be making the most mundane of inanimate objects suddenly seem intense once enlarged, or just the sight of a van shrunk down to the size of a Micro Machine that’s driving on the road like a little toy. He’s also used the numerous possibilities to craft some very creative action sequences, which really take advantage of the fact that the heroes can shrink or enlarge anything at any given time, and it seems to have been tons of fun to shoot as it is to actually watch on screen. It’s a good mix of action and comedy, and it’s certainly a lot of fun to watch, but there is a slight danger of it going a bit too bonkers for its own good – luckily, it never goes off the deep end, but with such strange and surreal ideas being thrown at you a mile a minute, you’re cautious about being burnt out way too early. However, it is made extraordinarily appealing by the cast which really do add a warm sense of humanity to all the pseudo-science malarkey going on in the foreground. Paul Rudd, whose eternal youth can only be explained by him not only having found the Fountain of Youth but then proceeding to wire it to his plumbing so he may consume it as his everyday tap water, is an incredibly likeable lead here, sharing great chemistry with everyone he acts off of from thespians like Michael Douglas and Laurence Fishburne (who shows up in a critical role as Pym’s former partner), to young Abby Ryder Fortson who plays his adorable young daughter Cassie, to of course Evangeline Lilly who gets to shine in more ways than one as his new crime-fighting partner. Even the villains, specifically Hannah John-Kamen as the troubled Ghost, are sympathetic as the film really takes its time to establish that they are not just one-dimensional bad guys, and when you see elements of her backstory and how she got her unstable powers in the first place, you’re almost rooting for the antagonist to achieve her goal as much as the heroes. It’s a very well put-together cast, all of whom you can feel comfortable spending a good amount of time with, and who you absolutely want to see a lot more of in the future. Ant-Man and the Wasp is a bright and entertaining action-comedy that ups the ante (no pun intended) in both its action and its comedy, and continues to benefit from a likeable cast who really inject some humanity into this far-out science-fiction premise.